It’s cold in my office today so I am typing fast to keep my fingers warm! 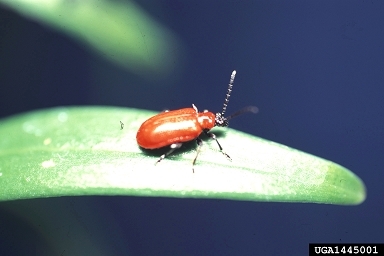 However, even those beautiful Lily leaf beetle (LLB) adults have the bad habit of feeding on your lily leaves – and getting started as soon as the leaves emerge above the soil. And they like all true lilies and fritillaria (daylilies are safe). When the eggs hatch, the larvae join in on the feast. In some areas, it has become almost impossible to grow lilies! But don’t give up! Help is on the way! The University of Rhode Island Biocontrol Laboratory has tested several tiny wasps that lay eggs in the LLB larvae and tried them out in several New England states. Luckily, the wasps have set up house and spread from their release sites. It’s not a quick fix but every little bit helps. NYS IPM’s Brian Eshenaur is coordinating a project to release the beneficial wasps around NYS (don’t worry, they don’t sting) in coordination with several county Extension offices. The first release was this week and we are excited to learn if they parasitize the larvae and then spread. Maybe to a lily bed near you – so you can enjoy growing lilies again. It’s almost enough to make you appreciate those beautiful beetles . . .